The truck company will build a limited run of 124 Abarth-inspired semis. 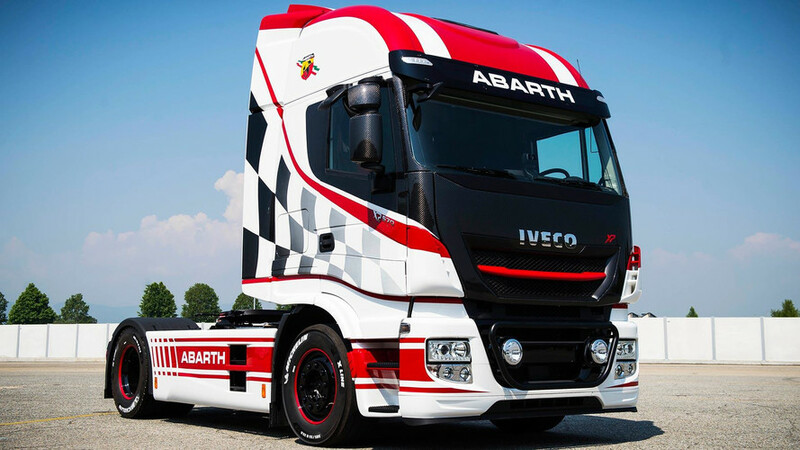 Truck maker Iveco will be the official hauler for the Team Abarth racing crew for the next three years, and the deal will result in a pair of semis with the performance division’s famous scorpion-themed livery. The Iveco Stralis XP and Eurocargo trucks will be supporting events like the Abarth 124 Rally Selenia. Iveco will also build 124 units of the New Stralis XP TCO2 Champion with a body inspired by the Abarth 124 Spider. The racing crew will use one of these as a support vehicle during events, too. The Abarth 124 R-GT rally car is the firm’s competition machine available for customers. The model features a 1.8-liter turbocharged four-cylinder with 300 hp (224 kW) and six-speed sequential gearbox. Road car buyers can opt for the Fiat 124 Spider Abarth with a 1.4-liter turbocharged four-cylinder engine that makes 165 horsepower (123 kW) and 184 pound-feet (250 Newton-meters) of torque. Buyers can choose whether the engine routes through a six-speed manual or a six-speed automatic transmission with paddle shifters. The trim also gets a sport-tuned suspension and limited-slip rear differential. Brembo brakes are an option, too. 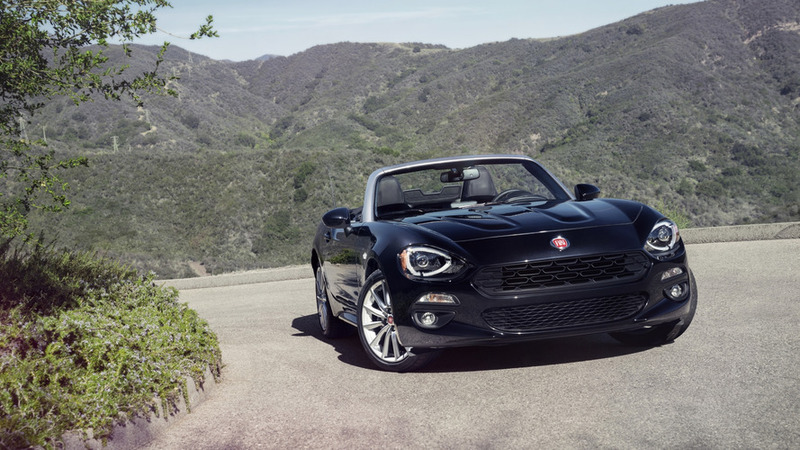 Through May 2017, Fiat has delivered 1,990 examples of the 124 Spider in the U.S, including 564 of them in the fifth month of the year. In comparison, Mazda has moved 6,398 units of the MX-5 Miata in the U.S. through May. The two models share the same platform. Fiat also recently announced a new $495 styling package for the 500 Abarth in the United States. It lets buyers choose between black, red, gray or white for the roof, mirror caps, body stripes, and spoiler. 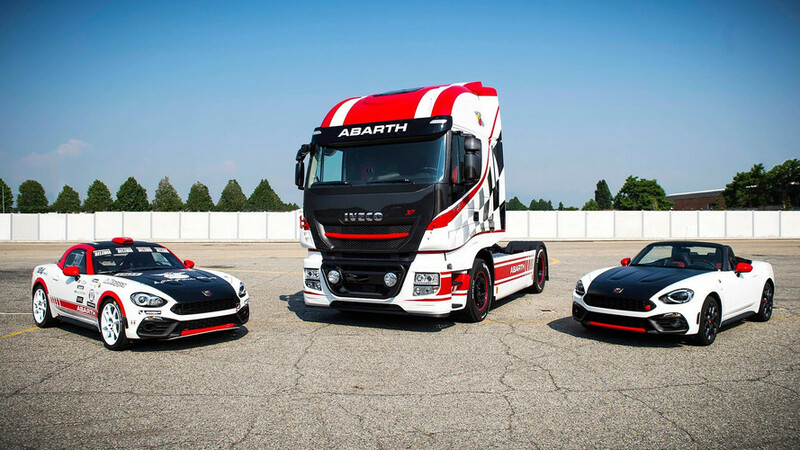 IVECO is set to be the official supplier of logistics for Team Abarth: two IVECO vehicles will be part of the Abarth support fleet, - a Stralis XP and a Eurocargo, "International Truck of the Year 2016". With this prestigious partnership, IVECO celebrates the legendary car brand - one that succeeds better than any other in communicating the competitive spirit of the racing circuits and rally roads, as well as sharing the values of sportsmanship and performance which are in the Scorpion's very DNA. This collaborative relationship has its roots in the past: since the early eighties, IVECO has supported the Scorpion Team in numerous world-class competitions, contributing to the historic success of the brand. To honour this partnership between the two brands, IVECO is set to produce a special limited edition version of the New Stralis XP TCO2 Champion with just 124 models decked out in white livery with red and grey finishes, the traditional colours of the team. These 124 models celebrate the famous Abarth 124 Spider, a car with legendary status on the roads and on the twisting rally tracks. Number "zero" of this limited edition - that is, the very first vehicle of the series to come off the production line - will be used by Abarth for logistical support during the races. This limited edition series also draws inspiration from the New Stralis XP Abarth "Emotional Truck", a unique vehicle and the only model ever produced, as a special tribute to the partnership between IVECO and the Scorpion team. The vehicle livery was designed and created by the Abarth Style Centre, with special attention dedicated to customising the vehicle with the colours and the graphics of the brand. The vehicle interiors, in true Abarth style, echo those of the Abarth 124, with leather upholstery on the seats, steering wheel and door panels. The vehicle will be the star of the show at all of the FIA European Truck Race 2017 championship circuits, and will be on display in the IVECO paddock. The "Emotional Truck" model celebrates the superb levels of performance achieved by the New Stralis XP, the most reliable and fuel-efficient vehicle on the market today, designed to maximise reliability, reduce CO2 emissions and slash the TCO (Total Cost Of Ownership). The new and improved drivetrain, the new top-of-the-range gearbox, the fully redesigned engine, and the widely popular and proven HI-SCR technology will be coupled with the latest generation GPS predictive functions and a host of new features to achieve fuel savings of up to 11.2%, as verified in recent tests conducted by the German Certifying Body TÜV. The extraordinary performance in terms of TCO and CO2 emissions reduction make the New Stralis XP a true TCO2 champion.